Hillary Clinton's struggling campaign for the Democratic presidential nomination is collapsing faster than you can say "Bernie Sanders." And Democrats are now starting to ask if Sanders, the rumpled, fiery Vermont socialist, could beat her in enough primaries to weaken her prospects in the general election, if not defeat her outright. Sanders, who was once dismissed by party leaders as a kooky left-wing insurgent with little grassroots support, is giving Clinton the political fight of her life. The finger-jabbing Sanders is taking full advantage of widespread economic dissatisfaction in his party's base, among young and working-class voters, who have flocked to his soak-the-rich, big-government campaign in huge numbers. Clinton managed to barely eke out a tight win in the Iowa caucuses that for all intents and purposes was a virtual tie between the two candidates. Then Sanders trounced the former secretary of state in New Hampshire, worse than anyone expected, and is now in a dead heat with her in heavily Democratic Nevada -- a state she once declared her "firewall." But a new CNN/ORC poll in the caucus state this week shows the two of them in a neck-and-neck race among likely caucus voters. Forty-eight percent said they will support Clinton, while 47 percent back Sanders. Sanders has been running a stronger ground game, with a dozen campaign offices around the state, outspending her in TV ads by 2-to-1, according to the Las Vegas Review-Journal. Even with its heavily pro-Clinton labor unions, Nevada is the chance to put to rest "this firewall fantasy that the Clinton campaign has put out there," says Sanders' campaign chief, Jeff Weaver. "If we do well, it destroys that myth." Last month, Clinton had a 25-point lead in the state, but her weak performance since then in the polls and at the ballot box has badly tarnished her candidacy. Clinton strategists have been betting on the state's large Hispanic population, though in 2008 some 70 percent of caucus-goers were white. But Sanders is winning over many voters in the Hispanic community with economic appeals to solve the problems of fewer jobs, declining incomes and growing poverty. Working against Clinton, and helping Sanders, is the damaging economic residue of the Great Recession that sent Nevada's jobless rate soaring to one of the highest in the country. "The people of Nevada were some of the hardest hit" by the long recession, Weaver said. "People lost their homes, they lost their jobs." Heading into 2016, the state's unemployment rate was nearly 6.5 percent, well above the national rate. And it's higher than that among lower-income Hispanic workers. This is the aggrieved political environment that plays well to Sanders' wealth-bashing, economic inequality message. One of the Latino campaign supporters speaking in his behalf in his TV spots is former state legislator Lucy Flores, who says Sanders is the only candidate who can fix the economy. In a frantic bid to turn her campaign around, Hillary has put husband Bill Clinton on the campaign trail to speak in her behalf, but not always with the best results. In an appearance last week in Memphis, the former president told the crowd the economy was "rigged," using one of Sanders' campaign terms. The reason why, he said, was "because you don't have a president who's a change maker ... with a Congress who will work with him." "It sounded like he was agreeing with one of Sanders' central arguments about income inequality -- but blaming the sitting president for it," reported Abby Phillip in The Washington Post. "The comments launched a barrage of tweets and more than a few GOP attacks accusing the Clintons of hypocrisy," Phillip wrote. But "once again, the former president was on the wrong side of the headlines." In an earlier speech, he attacked Sanders -- something the Clinton campaign did not want him to do -- accusing the senator of running a dishonest campaign. It was a reminder of the problems her husband stirred up in her losing 2008 campaign against Barack Obama. A Post headline this week described Hillary's dismay this way: "Bill Clinton on campaign trail: A help and a headache." 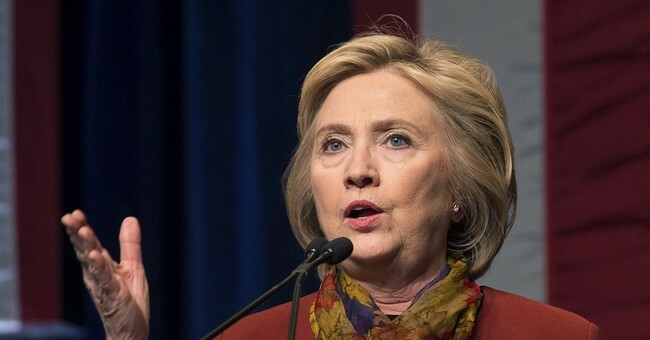 Hillary Clinton's campaign for the nomination is running into unexpected political headwinds from an unlikely opponent who has focused almost entirely on an issue she said nothing about throughout the long, painful, seven-plus years of the failed Obama economy. Could Bernie Sanders beat her? Last year, that seemed unlikely. Now, all bets are off. Her weak, head-to-head numbers against a 74-year-old socialist challenger, who not too long ago was all but unknown nationally, suggests her campaign is in trouble on a number of fronts. She faces serious questions about her honesty and trustworthiness. She is still under investigation by the FBI, the State Department's inspector general and others in the government about releasing classified information in her reckless use of an unsecured private email system. And Sanders is breathing down her neck about a cozy relationship with Wall Street that has been bankrolling her campaign. Among Nevada's Democratic caucus-goers who say the economy is their chief issue in choosing a candidate, 52 percent say they support Sanders versus 43 percent for Clinton. The political chances of the GOP's future nominee are looking better all the time.